This is going to sound silly but do you put anything on your noodles like butter or oil? Or are they just boiled and plated? 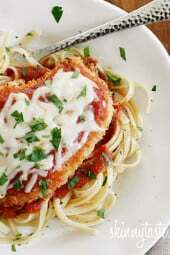 I LOVE this recipe and I always use it when making chicken parm, I just never make the noodles. Don’t know what Gina would say, but I’d add some butter to the noodles along with a couple herbs. Planning to make this tomorrow. Haven’t tried a recipe of hers I didn’t care for yet! IF anyone that follows WW please be careful. Ive checked and a few of her recipes are off from WW points this on she says is 4 points but once u plug everything into the app all the nutrition information the points are actually 5 points not 4. Please check before making. Dana, you MUST use recipe builder when getting points. The SmartPoints® calculator isn’t meant for recipes and will often give you the wrong points (usually higher) because it’s counting 0 points foods such as eggs, chicken, fruits and vegetables. So if you see a recipe with a SmartPoints® value that’s different from what the calculator tells you, that is why. It was delicious thank you for the recipe. Cooked mine in iron skillet just to brown-these were smaller & thinner than the larger chicken breasts. Browned & used Newman’s Tomato Basil Marinara & Buckwheat soba noodles which were a bit overcooked but tasted okay. Baked at 350 deg because of smaller size and only 15-20 minutes. Just right! Easy and fast dinner. Thanks! I made this and it was a hit! Came together easily and was delicious. Another great recipe, thanks Gina! This was a hit with my family. We all love Italian, and so it was great to find a lighter version of this dish to try out. Made this a couple days ago and I’m already craving it again! Me and my 9 year old loved it and practically licked our plates! I changed nothing. Thanks so much for the recipe! Super easy! You have a Knorr ad that pops up on your site, right over the directions of this post. I would love to try this recipe and pass it on however it looks like I’m just out of luck. I just thought you should know so more people like me don’t get excited about the chance at making this recipe only to find a list of ingredients and no instructions. Thank you. 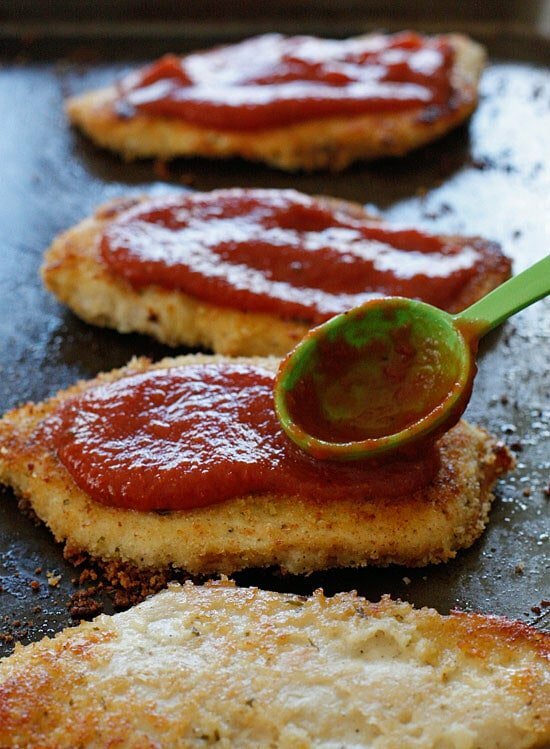 Just made these exactly like the recipe states and it was absolutely delicious, so moist and tender, thanks again for all your time to create these delicious recipes! This dish was awesome! My whole family loved it- thank you, Gina! Does the carb count on this dish count the pasta or just the chicken? Just the chicken, the pasta is optional! If I wanted to make these Keto – what would I use instead of the flour? Thanks! Has anyone tried cooking the chicken in an air fryer? any tips if you have? I have made this a few times and my whole family loves it! Quick question though: does using regular breadcrumbs negatively effect the points? I noticed on the WW site that whole wheat are two points for 1/4 cup v. regular at 3 points. I wasn’t sure when divided amongst if it would make that big of a difference. I have never successfully been able to find whole wheat breadcrumbs and, quite frankly, I’m too busy to make my own! Thanks for another wonderful recipe! I’m confused. Is the oven supposed to be preheated to 425 or 450? Did you flip the chicken half way thru? This is a classic and one of the first skinnytaste recipes I made. Love the healthy spin on a classic dish. The marinara is great. This is going on my menu next week! The best chicken parm I’ve had. Don’t think I can ever go back to the typical fried version(s). I made it for my boyfriend who tends to be a little picky; he devoured it and finished off the leftovers the next day. It was very easy to cook on a weeknight, but tasted like I spent the whole night in the kitchen 🙂 Thanks for another awesome recipe ! My family LOVED this dish. Nice to have a healthy alternative to a family favorite. A delicious lightened version of an Italian classic. I have been making this for quite some time and it is a family favorite. My changes – I use half breadcrumbs and half panko. I dip in egg whites instead of oil or butter. I bake on a wire rack and they turn out very crunchy. I make my own marinara to top them. Just had this last week with a size of the Birds Eye Zucchini Lentil Noodles drizzled with more marinara. Delicious! Been making this dish for almost 5 years! 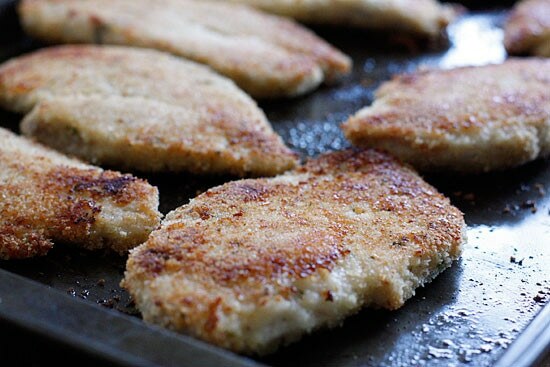 Never need to fry cutlets again. Delicious!! 6 stars? My husband is always skeptical when I want to make a WW recipe, but he loved this! This was delicious and low calorie enough that could add some pasta with it. Made a ton so great leftovers for rest of the week! 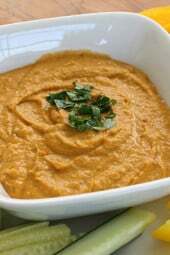 Absolutely love this recipe, and have prepared it many times! Delicious! Will definitely be making again. I found they needed flipped over half-way through cooking, though, or would have been too done on one side. I also only had 2 chicken breasts, so I split them (per the recipe) but also cut into smaller pieces. Everyone loved it! I made this for my husband last night and he loved it! I followed the recipe exactly, except I did add some extra sauce and cheese. He said it was delicious and cooked perfectly. Will definitely be making it again soon! Did you have to flip the chicken for it to brown? My chicken isn’t browning at all. I didn’t flip them and they turned out great. In your point values you say it’s 4 smart points, +6. Can you please explain that? Is it 4 or is it 6? This was fantastic, we all loved it! The only slight change I made was to use both butter and olive oil, 1 tbsp each. I also reduced temp to 400, baked on a rack for 20 minutes, it came out perfect. Served over angel hair. Will definitely be making this again. Thank you! This is my family’s most requested dinner. Everyone loves it (a miracle!). Easy to make and easy to make ahead for company. Just prep the chicken before company arrives and pop it in the oven when you are ready. Thank you for the wonderful recipe! Amazingly good! This was quick and easy! Thank you for this recipe. Made it tonight and it was a winner!!! I made this as written and it was delicious. Oven temp was not too hot, chicken came out perfect. 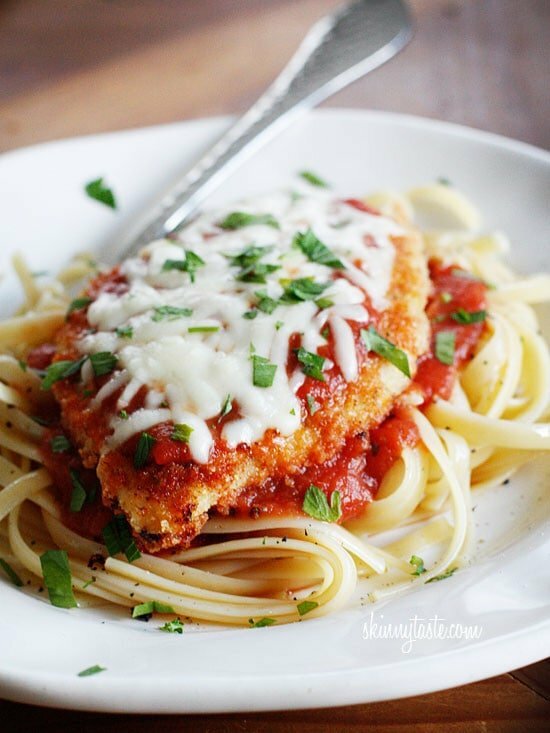 Pingback: Chicken PARM – Hello World! With this new program that just rolled out, would this receipe still be 5 points? What kind of pasta was used for this ? 1. You say four breasts to buy, cut in half so you have eight and video shows clearly four pices breaded and cooking. Amount of breading and cheese can’t cover eight pieces. 2. If you are putting fresh parsley on at end, put it in ingredient list! I’m trying to print the recipe, but there is a big blank space that covers the text on the bottom left side, like an invisible box is layered over the text. Help. Just made this baked parm chicken and it was outstanding. I use fresh pasta and Classico sauce which is lower in points! Yum! This comes out as 6 Smart Points in the Weight Watchers recipe builder, not 5. 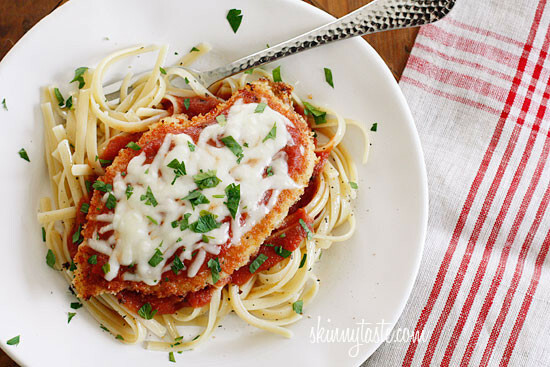 I love chicken parm, and this recipe is terrific. Just wondering, could you do the same steps if you wanted veal instead of chicken? What is the sodium on this? This was a HUGE hit with my kids. Absolutely delicious and very easy to make. We served parmesan roasted broccoli on the side. Great! Love when the kids enjoy it too! I noticed this is identified as freezer friendly. Do you completely cook this and then freeze it? Any instructions on warming up? I don’t want it to be soggy. Thanks. Gina, I made this tonight using the baking method (no airfryer) and paired it with the cucumber Greek salad. My family wants it again! Thank you!! Thank you for this recipe! It s absolutely delicious and I can’t get over how simple it is to make! Perfect for large gatherings too!! Nom noms. Clean plates all round! Thanks Gina!! I could eat that everyday!! Lol glad you enjoyed it Caroline! Should i suggest for you to add a feature in your website , so that we can save our favourite recipes? incredible! I followed one of the comments and put the oven at 425 and baked them for 20 minutes. soooooo good! How would I freeze this? I would bake then freeze. I love all your recipes especially this one! I am working on some freezer meals and wanted to know how you suggest I reheat this? Do you think I could use chicken tenders that I have on hand, instead of chicken breast? I substituted the bread mix for garlic and herb. I hope it turns out good. I think I will serve this with the new frozen zucchini pasta Thanks for the recipe!! I’ve never seen these at the store where do you buy them? You bake and assemble the cheese and sauce to be popped in the oven later? Can this be breaded and then refrigerated a couple of hours, then baked? For some reason I haven’t made this until tonight….. absolutely delicious! My kids gobbled it up and I feel like it will be in the skinnytaste rotation 😛 thank you! Made this last night for dinner…..Was it ever a HIT!! I did add some garlic powder and I only cooked it for 20 minutes. But it is now in the “rotation” of meals that I’ve gleaned from your site. I’ve turned a bunch of people on to your cookbook, cause it’s my “GO TO” book for easy, delicious meals. it was Great!!!!! i added some garlic powder(a staple in my kitchen) and lemon pepper. Are the noodles included in the points? What is the green herb you have on top of the chicken. Is it cilantro? The chicken wouldn’t be tough. It definitely doesn’t need a marinade. I pounded mine to make them a bit thinner, and shortened the cooking time just a bit. I put a lot of my previously-fried-now-baked breaded things on a rack (sprayed with non-stick spray) in a backing sheet. Things seem to cook (and brown) a little better that way. I do love the lemony chicken idea, which I did once. Tonight I’ll be going Italian style all the way… either with whole what linguini or zoodles.. And no fried/splattered mess to clean up. Yea!! 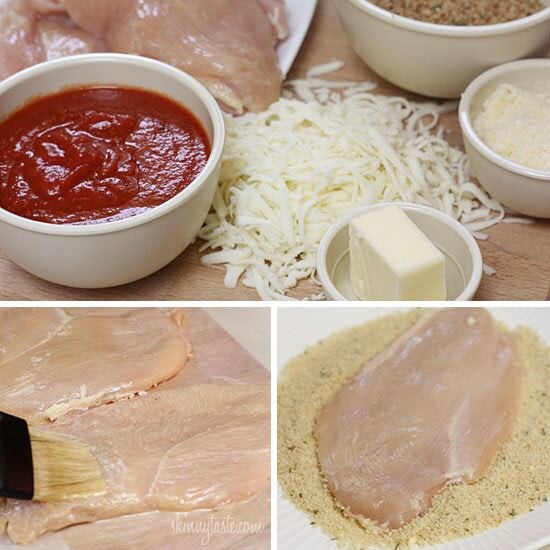 Do you cut the chicken breast in 1/2 horizontally so it is less thick or vertically? Made this last night for the family… followed recipe exactly. Another delicious meal! The flavor is still there without frying – a great alternative! Served families over penne and mine over zoodles. Glad I made a double batch because my husband enjoyed 2 pieces and took some for a chicken parm sub for his lunch today! Thanks for another great recipe! Would you know the sodium amount in this? It is blank. Sodium would depend on the breadcrumbs, moxxarella and sauce that you use. I noticed that my seasoned whole wheat bread crumbs have alot more sodium than regular Italian bread crumbs. Store bought sauces and mozzarella can also vary on sodium. If you wanted to make this low sodium, you can buy no salt added bread crumbs and make your sauce with no salt canned tomatoes. This recipe was BOMB. Made this for my picky boyfriend and I. Followed directions to the T and it came out perfect. I prefer my chicken on the well done side and this came out just to my liking. Thank you SkinnyTaste,.com I will be making this one plenty more! Made this tonight. It’s a winner. Everyone loved it. So good! 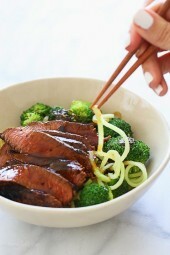 I made this tonight over garlic lemony zoodles; it was awesome! Oh wow! I just bought some mozzarella to make chicken parm. I have the last of my homemade sauce to use up, but I’m definitely doing the lemony version next time! I bet this would be good served over some spaghetti squash! I substitute spaghetti squash for pasta in a lot of my meals. That’s how I served it, over spaghetti squash and it was DE-LISH!! Definately a keeper! My family loved this! I reduced the temp to 425 and it only needed 20 mins to cook. Thanks for a great recipe. 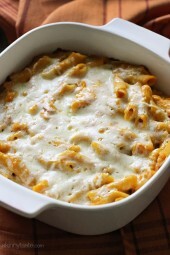 Can’t wait to make this tonight. I cooked a huge pot of homemade sauce on Monday and froze it. Love both your books! I found that 450 degrees was way too long and too hot for cooking this chicken. I think 350 degrees would have been better. Other than that it was really good. I agree. I followed the directions to the letter and the cutlets came out black on the bottom and the mozzarella way overcooked, even for the 5 minutes. I will try again, but at a lower temp. Thanks for the tip! It came out perfect!